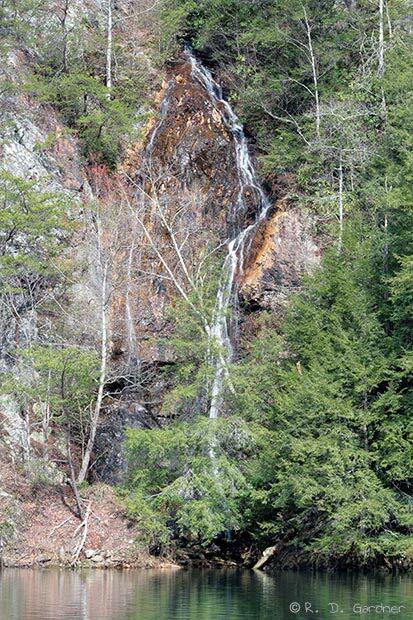 This waterfall is unique for northeast Tennessee in that it empties onto a lake - Wilbur Lake. Past that the waterfall is nothing special. The main problem is that Little Laurel Branch has a small watershed and low flow much of the year, and in fact the photo above had very little flow. I've seen other photos of this waterfall with much more volume but again it will be hit or miss due to the small watershed. On the up side, there is no hike. In fact, the setting is incredibly beautiful and well worth the drive. There is a picnic area directly across from Little Laurel Branch Falls and just a short drive further upstream is Watauga Lake, another gem in the mountains of northeast Tennessee. Grab your camera, some lunch supplies, and check it out. How to reach Little Laurel Branch Falls? Now that's a good question. To be honest I don't know the roads all that well in this area and I'm pretty sure each time I've gone this direction I've either taken a wrong turn or just followed my nose - the end result being that I've never gone the same way twice. My advice is to use the map links below and also visit Mark Peacock's website for a good verbal description. Use the following link to customize your own directions to Little Laurel Branch Falls. No hike. Just park your vehicle and walk to the edge of the lake. From the stain on the rocks (you can see it in the photo) one can surmise that there is frequently more water flow than was present the day I visited. So my first tip is to visit in the rainy season. With low flow (nearly a drought) conditions the waterfall is not photogenic. Lighting conditions were not good. I had the typical harsh, noontime light that is the bane of all good photographers. Unless you're out for a picnic, plan to visit in the morning or evening or on a very cloudy day. Due to its location the waterfall is exposed to sunlight a good portion of the day. When water flow is higher I would recommend using a good tripod to get an exposure of 5 seconds or so. Focal length - A zoom lens will come in handy here. The main picture above was taken at 86 mm while the zoomed in picture (last one on the left) was taken at 190 mm focal length. As always I recommend the use of a polarizer to cut down on reflections (ok, by now you should be leaving that polarizer on your camera all the time, right?). You will need to correct the color cast of the polarizer either with a warming filter or with post processing with a program like Photoshop.